At approximately 7pm EST on Tuesday, Coinbase announced its intention to add bitcoin cash (BCH) to its platform. For those of us plugged into the marketplace, the addition of bitcoin cash wasn’t a big surprise. What did cause quite a stir was the way the announcement was made and the market trends that surrounded it. After Coinbase’s announcement this summer that they would eventually support the withdrawal of BCH forked from BTC balances, most market observers speculated that the exchange would add BCH functionality in 2018. However a number of things this week did raise some eyebrows. First of all, Coinbase made the announcement through social media, towards the end of the day. This is an interesting choice when it comes to announcing something as important as adding a new asset to the exchange. The news also came a week earlier than anticipated. Secondly, we observed a change in BCH price dynamics prior to the announcement and very violent moves across a number of exchanges post announcement. Indeed, BCH started rallying against BTC as early as 12 PM EST on Monday and BCH ripped higher while BTC moved lower starting at 7pm EST on Tuesday. Thirdly, Coinbase’s decision to allow for “post only” order types on GDAX (no market orders, just limits) was surprising in itself. It was further exacerbated by its abrupt decision to wipe the order book clean and halt trading entirely for new orders right after a sharp uptick in volatility. These trends have, understandably, caused an onslaught of conspiracy theories. The social media response to Coinbase’s rollout of BCH has been loud and, at times, nasty. It is hard to believe there was any coordinated insider trading effort within Coinbase itself. However, it is plausible that information about BCH leaked outside of Coinbase and that people outside of the company started pre-positioning their portfolios accordingly. In the day and age of social media, it is entirely unsurprising that a sensationalist view of this information would spread like wildfire. 1. The evidence for front-running was there. 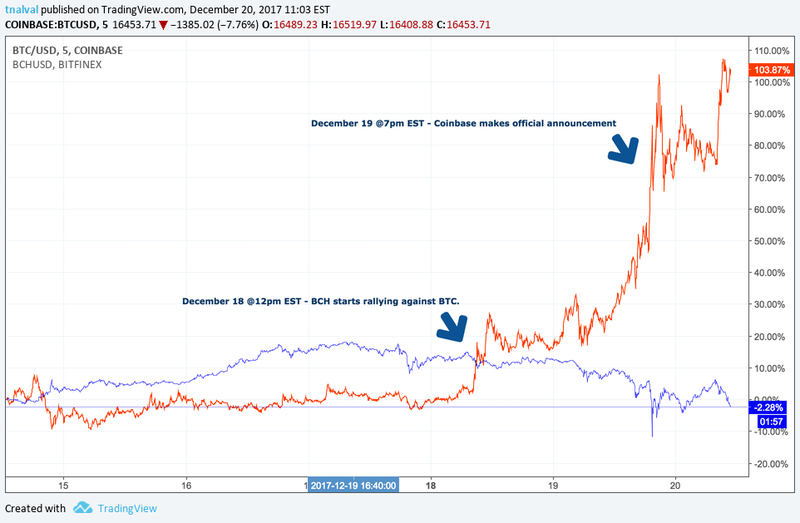 From the theoretical “leak date” on 12/18 to right before announcement on 12/19, the price of bitcoin fell 15% while, in the same time period, the price of bitcoin cash rose nearly 45%. All on higher than normal volumes for that time period. That isn’t a coincidence. 2. Coinbase has become too powerful. We applaud their efforts: they have successfully built the benchmark consumer-facing app for digital asset trading with great UI/UX. However, Coinbase has now effectively become the S&P 500 and E-Trade in a world where there are no other indexes or consumer trading platforms. They control the index adds and deletes. They control the trading of the retail market. That is way too much power for a single company in any marketplace, not just cryptocurrencies. 3. The marketplace is the mob. If you don’t do right by the mob, they will come for you. This means you will spend a lot of money on PR and legal. Enough said. While we’re sure Coinbase has plenty of cash in their marketing and legal budget for 2018, they could’ve channeled this money towards scaling their trading infrastructure. We see this as a huge opportunity cost. 4. This is bad, but necessary. What happened highlights many structural flaws in the system. These flaws need to be addressed in order for markets to become more efficient and for capital to flow to good technology, good companies and good protocols. We also believe that these events illustrate need for regulation, not only to govern how material non-public information should be handled, but also to create a framework that can help mitigate market abuse by bad actors. It is important to remember that the leak of material non-public information is an enforceable policy in traditional markets. While the digital asset market is still largely unregulated, the road to legitimacy (and institutional assets) means that this kind of activity cannot happen. We expect regulators to look into this closely. We expect both the CBOE and CME to look into this closely as well. We will see how all of this will play out for Coinbase and the digital asset market in general. In the meantime, it is important to view what happened as necessary for digital asset trading to become less centralized and for promising decentralized protocols to really take shape.